Oldencraig Equestrian Centre prides itself with many years of experience in handling stallions. We successfully prepare them for the competition ring, for international grading and for their service at stud. We have recently completed a £250,000 air-conditioned American-style Stallion Barn with easy access to heated tack rooms, wash-down areas and horse solarium. The spacious stables are constructed from polished hard oak with individual windows. Every stable has automatic water drinkers, feeders, weaver bars and rubber matting. The newly refurbished barn also has its own oak panelled tack room with hot and cold water supply, and each horse has 2 bridle racks and 2 saddle racks. It is run by experienced staff with many years of experience of handling stallions. Oldencraig Equestrian Centre closely works with German horse mogul Paul Schockemoehle and Joseph Klaphake, as well as Olympic rider and trainer Johann Hinnemann to ensure the success of your stallion. 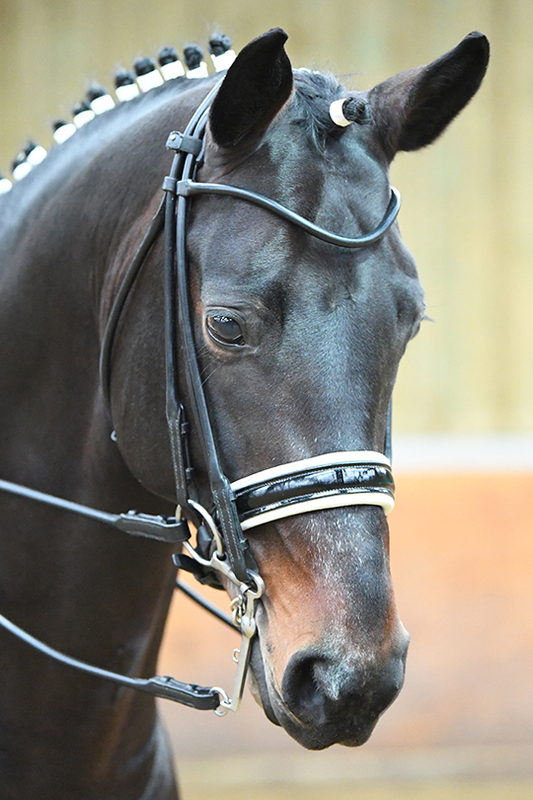 This KWPN stallion boasts a very modern build and captivatingly powerful gaits. Exquisite always presents an inspiring mechanic of movements and impulsion, travelling through the entire body swinging in rhythm. In Holland he was awarded premium stallion whom we will follow through the breeding season with high expectations.